I have my bag!!!! Hooray!! I can’t believe it, I thought I’d never see it again. The morning started just like the one before, waiting at the baggage carousel in Paris for a bag that never came. When it looked like all the bags were out, I went back to the baggage office to once again explain my convoluted baggage issue. The agent called the baggage handling supervisor who checked around “in the back” for a while and said it wasn’t there. I was completely deflated. I asked if there was any way someone could take me back to the infamous “special” room where all of the delayed baggage comes in so I could look around and see if I could find it. That got a “no” but the agent helping me said that he would go back a take a look himself. He was gone about 20 minutes and just when I was losing hope he came back to the office and announced happily that he’d found it and put it on the carousel – so over we went to retrieve it. As we walked over, I asked the million dollar question, was the bag he found the red one (Theresa’s – equally important, but not time sensitive) or the black one (mine)? It was the black one!! I was so excited. I was getting so sick of carrying the heavy, wheel-less duffle bag around and I just really wanted my suitcase back. Finally, some good news, maybe my luck is turning. 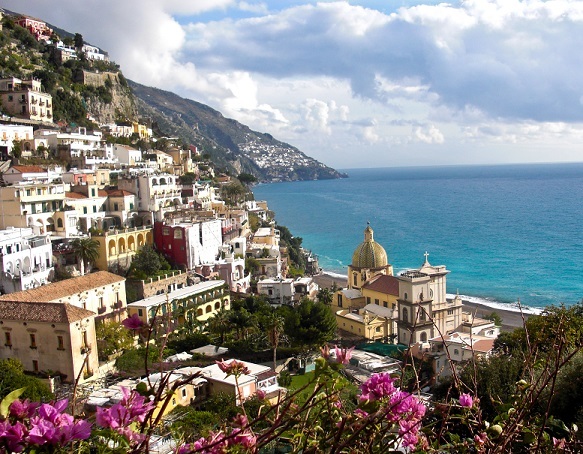 Can’t wait to get to Positano, Italy! The next step was to transfer everything between the bags and re-organize what I could send back to Atlanta. The final step was to convince Delta to send the un-needed bag back to Atlanta for me. I went to the Delta counter and they were most unhelpful, despite the copy of my record locator from Atlanta with the baggage supervisor’s ok to send my bag back on the next Delta plane. They said it was impossible for the bag and the passenger to travel separately. Honestly people, if that were true, would we even be having this conversation??? They sent me back to the Air France baggage claim office where, by now, I was a regular and I may or may not have told a little white lie about how the Delta counter sent me down there for them to check it on the next Delta flight. Between that and the copy of the record locator I showed the agent, he took care of it without much of a fuss. My extra bag is now scheduled to depart Paris tomorrow and be back in Atlanta by nightfall where Theresa will pick it up. What a relief! One major problem solved. Now, if I can just locate Theresa’s bag when I land in Naples today (allegedly, it arrived there yesterday) and work out the same arrangement to get it back to Atlanta safe and sound, we’ll be in business. And then I can resume having fun on this darn vacation!! I guess I shouldn’t have gotten my hopes up because when I landed in Naples this afternoon, Theresa’s bag was nowhere to be found…surprise, surprise. The agent at the Alitalia baggage service office was a walking, talking explanation for why the airline is going bankrupt. Absolutely useless. Working in my favor was the fact that the airport was tiny and all unclaimed baggage was in a roped off area where I could easily look through it. No sign of the bag. I even waited at the airport for the next flight from Rome to arrive to see if it would be on it, no luck. Out of options, I sent Theresa all of the claim information and she is working it from her end over the phone for a while. Seems like the Costa Rica baggage fiasco will continue to haunt us for a while longer. I’ll try again when I get back to Paris if it doesn’t turn up here before then. I walked into my elegant room at the Hotel Excelsior and was happy to see a nice fruit basket, a comfy bed and heated towel racks in the marble-laden bathroom…home, sweet home!! Finally, actual toiletries instead of the domino-sized bar of soap and plastic cup wrapped in cellophane I had been getting used to. After three nights in a row averaging 2-3 hours of sleep each, I am exhausted and really need a good 8 hours. I was tempted to crash around 5pm but I was determined to try some of Naples’ world-renowned cuisine…namely, pizza! I got a recommendation from the hotel for a non-touristy, authentic pizza place and headed out into the light rain. The dinner was delicious. I ordered a “Pizza Napoli” the local favorite with only tomato sauce, garlic and basil (no cheese, even!). It was divine, the best pizza I have ever eaten (and I never thought I would say that about a pizza without cheese). The crust was light and soft and the tomato sauce sweet and tangy, the garlic and basil were icing on the cake. I think I’m going to like the food around here. Very different from the rest of Italy but equally scrumptious. There is so much I want to see in this area (Amalfi, Positano, Vesuvius, Pompeii, Capri) but since the weather today has not cooperated, it’s time for bed. Day 2 brings more of the same from the local weatherman so I sleep in a little before heading to the train station to catch a train for Sorrento. I am planning to spend my second night there as it is a better launching point for exploration of the nearby Amalfi Coast. The Naples train station turns out to be more complicated than I anticipated, nothing is in English and no one speaks English. I had decided I would stop in Pompeii on my way to Sorrento since I figured that one was sight that could be appreciated rain or shine. I hoped that when I bought my ticket to Pompeii, it would say on the ticket which binari (platform) the train departed from…it did not. I asked a police officer in the station who narrowed it down for me by pointing in a particular direction. Upon closer examination of the stops listed of the trains in that area, I found my train eventually. Twenty minutes later, I arrived in Pompeii. Two thousand years ago, Vesuvius was thought to be just a mountain…until it famously blew its stack in AD 79. The devastating eruption preserved for posterity an entire ancient culture, discovered centuries later like an enormous time capsule. An entire ancient city remains today, in remarkably good condition. Everything from a theater to multi-family dwellings can be seen at the sight. And numerous drawings and works of art from Pompeii are on display in the Naples Archeological Museum. It is a bit eerie to wander Pompeii with the imposing shadow of Vesuvius hovering nearby. Luckily, the volcano last rumbled in 1944. It was a beautiful train ride the rest of the way to Sorrento. Unfortunately, shortly after I arrived, the weather got worse and it began raining steadily. I found my hotel without too much trouble and checked in just in time for dinner. My lovely executive level room at the Hilton Sorrento Palace had access to a lounge that was closed for renovation. Instead, the front desk agent said that I could give my room number at the hotel’s main restaurant and bar and they would have the same lounge offerings. I awoke to a gorgeous panoramic view of Sorrento from my balcony. Finally, the sun! I got ready quickly and checked out of the hotel to get to the train station where the local SITA buses depart for the Amalfi Coast. The SITA buses are a great way to get around in the Naples, Sorrento, Amalfi, Positano area. They run frequently and only cost 1 euro per ride. The 1-hour ride up the Amalfi Coast to the town of Amalfi is an ear-popping, cliff-hugging ride through the mountains that makes you pray the bus drivers know what they’re doing. Luckily, the ride is so incredibly picturesque that you hardly notice the steep drops into the sea below as you round each corner. I visited Amalfi first, the further of the two. I spent about an hour walking around and then boarded the bus back to Positano, where I really wanted to spend some time. Known for its impossibly vertical architecture, the pastel-colored buildings of Positano Italy seem carved out of the side of the mountain. The town has only one road that snakes its way from top to bottom; all other “roads” are stairs. The bus dropped me off at the top and I found the nearest set of stairs going down and started the lengthy, winding descent to the beach. More than 30 minutes later, I finally exited the last staircase onto the black sand beach. The Gulf of Salerno is impossibly blue before me and looking up at this charming little town is like stepping inside an impressionist painting. Absolutely exquisite. Positano is quiet and deserted today, most hotels are closed this time of year, but I can picture it in the summer months overflowing with tourists. I think I like this better. I wandered the tiny streets and staircases, taking my time on the way back up the hill and stopping eventually for lunch at a small café. Each level I climb offers another impossibly colorful view. There are still rain clouds in the distance but the sun shone brightly for my 3 perfect hours in Positano. Sadly, I board the SITA bus back to Sorrento in time to catch a late afternoon train back to Naples. By the time I arrive in Naples, the rain is back with a vengeance and I am even more grateful for the few hours of sunshine I was granted earlier. I stop off on the way to the hotel to get out of the rain and have some dinner. I have been looking forward to another opportunity to enjoy the terrific pizza places Naples has to offer and the restaurant that I wander into does not disappoint. Since it is still early for dinner by European standards, I am the lone customer of 5 young Italian waiters who greeted me with a gregarious, “Ciao, bella! !” and attended to my every dining need. BAG UPDATE: Just when you think the baggage drama is almost over, it gets even more twisted. After I recovered my bag in Paris Tuesday, I switched out the clothes I needed with the ones I didn’t and put the un-needed bag back on a flight to Atlanta. Then Delta promptly sent it BACK to Paris!! Theresa has been trying to follow up with Air France and by last night we had figured out that both of our bags SHOULD be in Paris. So, since I had another layover in Paris this afternoon, I gamely headed back to the baggage office, where by now, I am a regular. This time a had a new agent, a charming young man, who I had to again relate my entire saga to. He listened to my whole story and then coyly asked, “How many kisses will you give me when I find your bags?” (I swear to God, people, this is Paris.) I suggested he find the bags first and then perhaps we could negotiate. Turns out both bags were indeed located here in Paris (allegedly). My new best friend, the French flirt, said he would tag them for the next available flight to Atlanta. I escaped with an appreciative handshake.